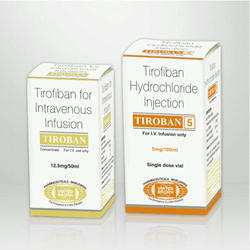 We are a leading Manufacturer of aggramed 5mg infusion, tirofiban injection and tiroban 5mg infusion from Mumbai, India. 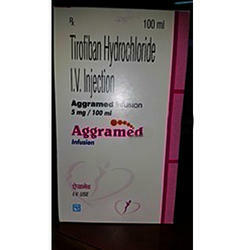 Tiro fiban(5 mg) Uses Aggramed 5mg infusion is used to prevent chest pain, heart attack and certain other heart and blood vessel diseases. How it works Aggramed 5mg infusion belongs to class of drugs called platelet aggregation inhibitors. It works by preventing the formation of blood clots and thereby helps in maintaining uninterrupted blood supply to heart. 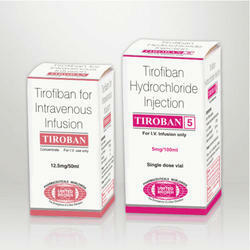 Salt Information for Tiroban Tirofiban(5 mg) Uses Tiroban 5mg infusion is used to prevent chest pain, heart attack and certain other heart and blood vessel diseases. How it works Tiroban 5mg infusion belongs to class of drugs called platelet aggregation inhibitors. 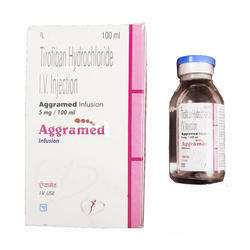 Uses Aggramed 5mg infusion is used to prevent chest pain, heart attack and certain other heart and blood vessel diseases.How it works Aggramed 5mg infusion belongs to class of drugs called platelet aggregation inhibitors. It works by preventing the formation of blood clots and thereby helps in maintaining uninterrupted blood supply to heart.Common side effectsNose bleed, Pain in extremity, Nausea, Abdominal pain, Chest pain, Blood in vomit, Coughing up blood, Increased sweating, Black and bloody stools. Nose bleed, Pain in extremity, Nausea, Abdominal pain, Chest pain, Blood in vomit, Coughing up blood, Increased sweating, Black and bloody stools.